Did you know that stroke is the fourth leading cause of death and the leading preventable cause of disability in the US? I didn't know until it happened to our family. Each year, about 795,000 Americans suffer a new or recurrent stroke - that's about one stroke every 40 seconds. Ours happened on a seemingly "normal" day in August of 2011. We are so lucky that when John suffered his stroke, he was at a Doctor's appointment. The Doctor recognized the signs and called 9-1-1. Imagine my surprise when I answered a call on my cell phone from my husband's number, and it was a Doctor - telling me he had sent John to the ER with symptoms of a stroke. In my opinion, that doctor saved my husband's life and I am forever grateful. When you recognize a stroke and immediately call 9-1-1, the person has a greater chance of getting to an appropriate hospital quickly and being assessed for treatment options. Many people don't know the warning signs of a stroke - I was one of those people. In fact, in hindsight, we believe that John suffered a series of small TIAs prior to the one that brought him to the emergency room with a dissected carotid artery. 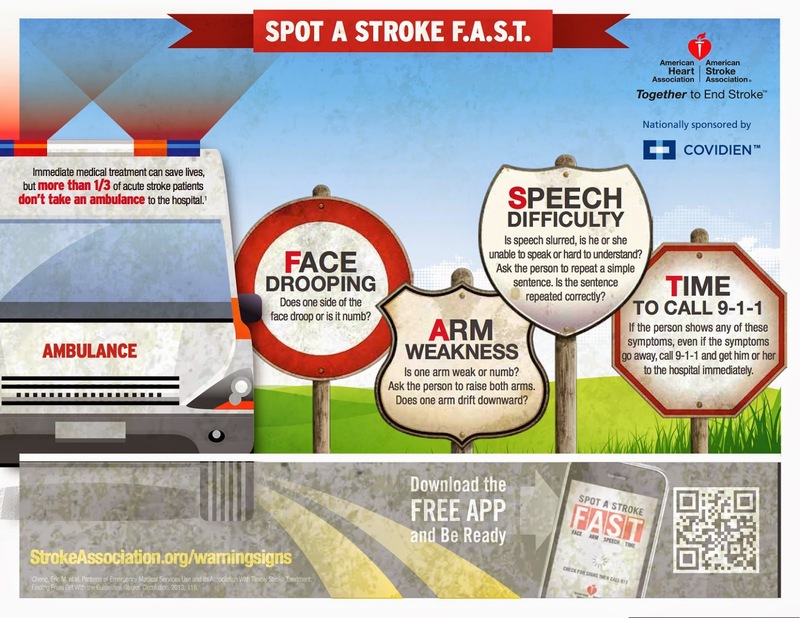 May is American Stroke Month so I'm working with the American Heart Association/American Stroke Association and the Ad Council to raise awareness about F.A.S.T. 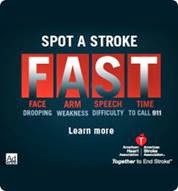 to recognize a stroke and know what do to in an emergency. You can also download the F.A.S.T. app for your smartphone. Don't be caught unaware - it can mean the difference between life and death. Disclosure - I was not compensated in any way for this post. It's something I believe strongly in and if sharing our story can help someone, that's what my voice is for. All opinions are as always, my very own.